Address unknown… Cuisine very well known…. 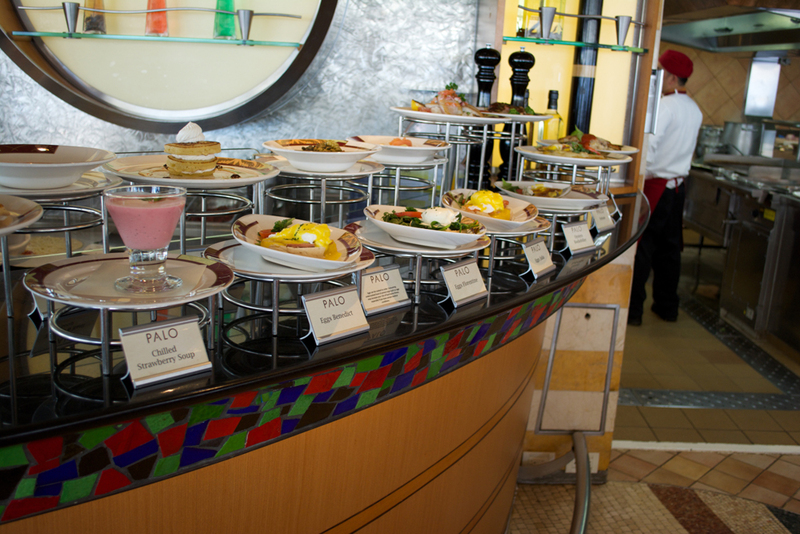 My wife Valerie and I recently had an opportunity to have both brunch and dinner at Palo twice while on a 14-night cruise aboard the Disney Wonder. 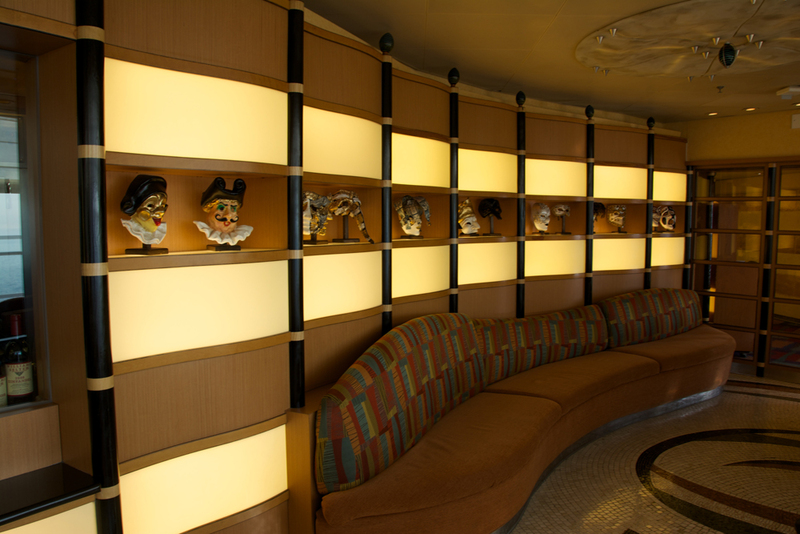 During a ship tour we found out why it is decorated in the style that it is as well as how the restaurant came to be named. The Wonder, and its sister ship the Magic, were both built in an Italian ship yard near Venice, Italy and the Imagineers took their design clues from this area. In the canals of Venice you will see numerous poles that the inhabitants use to tie up their gondolas while going about their business. The Italian word for pole is palo. 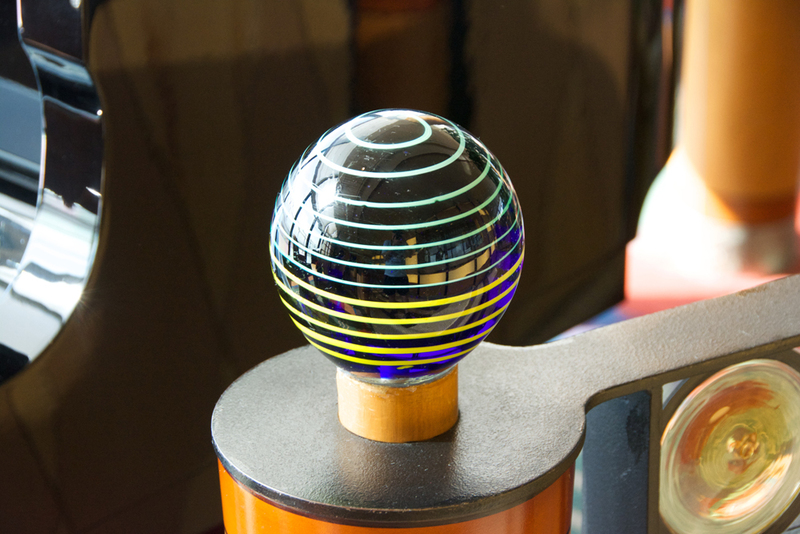 You’ll see the pole motif reflected in your surroundings as well as two other design elements that the Venice area is known for, whimsical masks and Murano glass. 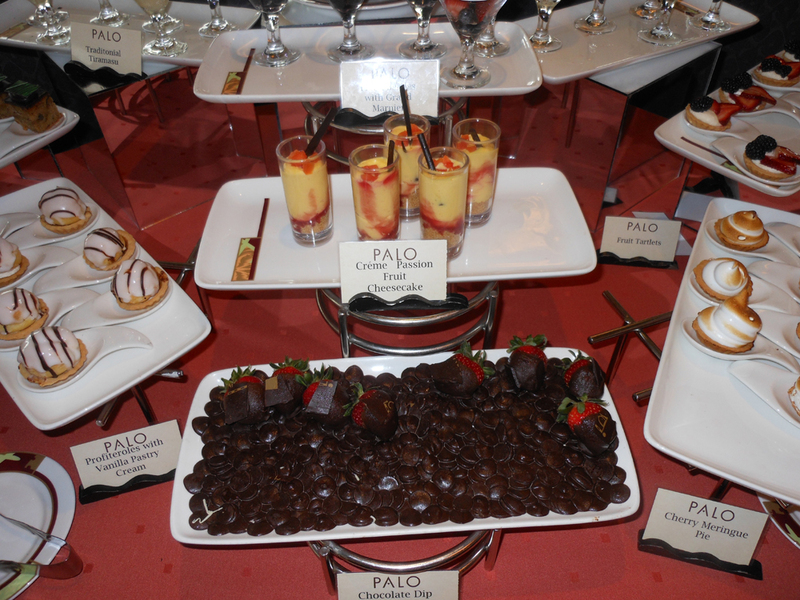 Brunch and dinner at Palo are two completely different dining experiences. Similar to the review we did for Remy [see review] we will try to give you a flavor for both experiences. 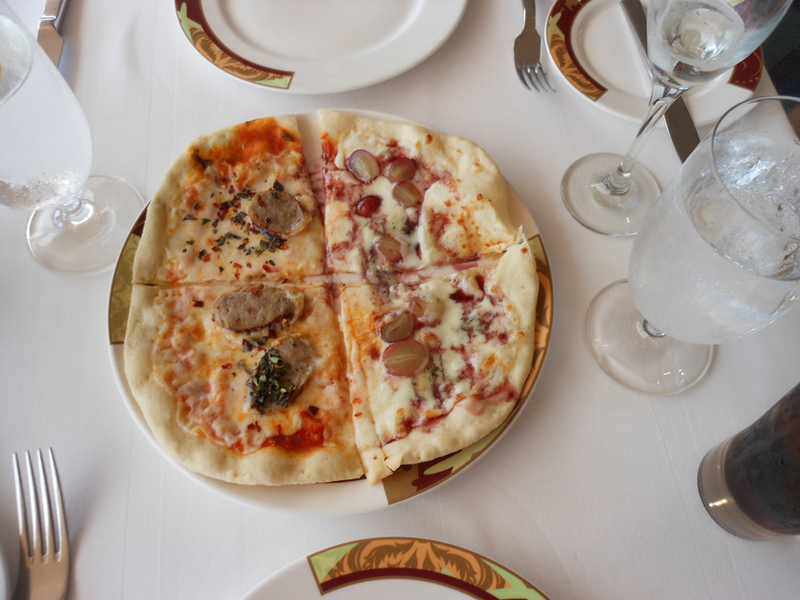 With some luck you’ll be able to decide for yourself which meal to book if you can’t do both on your next Disney cruise. But first, let me explain a bit about the restaurant and how we became acquainted. Over several years we have been fortunate enough to cruise on all four of the Disney Cruise Line ships, the Magic, Wonder, Dream and Fantasy. 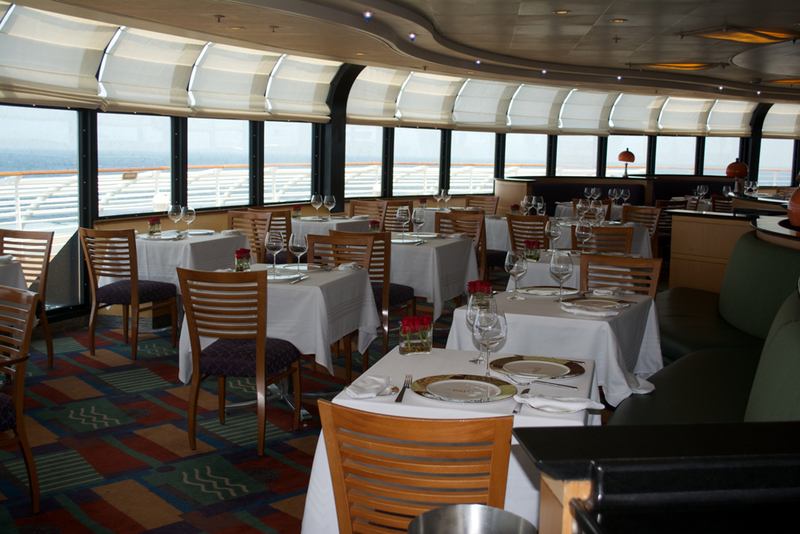 Each ship has an adult alternative restaurant in addition to the main dining rooms. It is located at the stern of the ship with wonderful views out over the water. 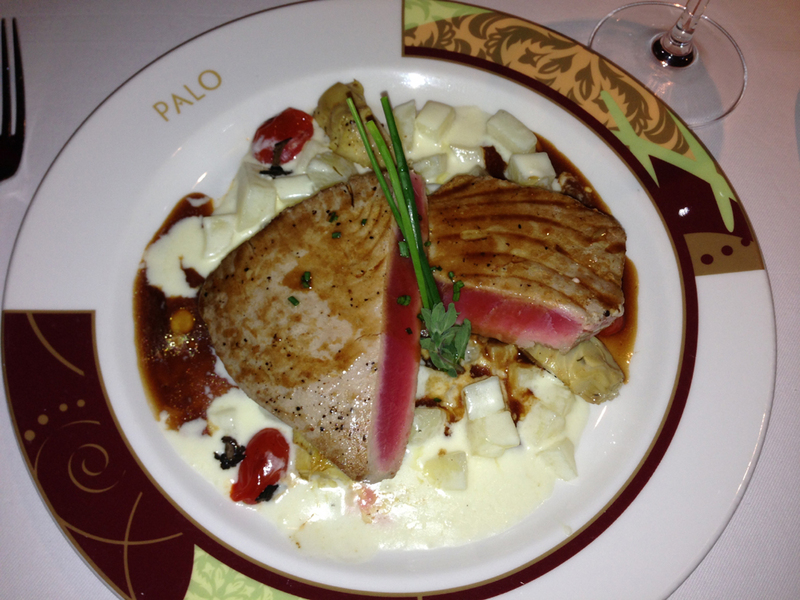 We’ve made it a habit when cruising on a Disney ship to treat ourselves to dinner in Palo one night. Usually we schedule Palo for a day that the ship has called at a port because we like to watch the island slip away while we eat. 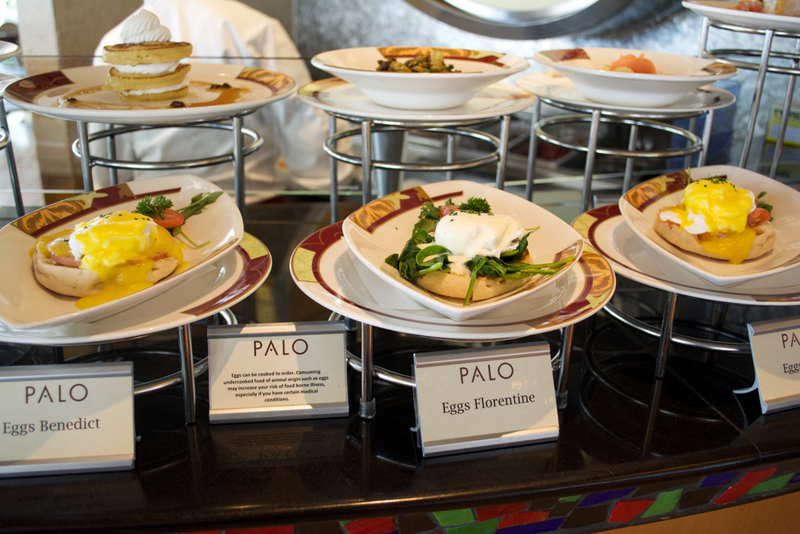 Brunch at Palo is a different kind of meal and is only offered on sea days. 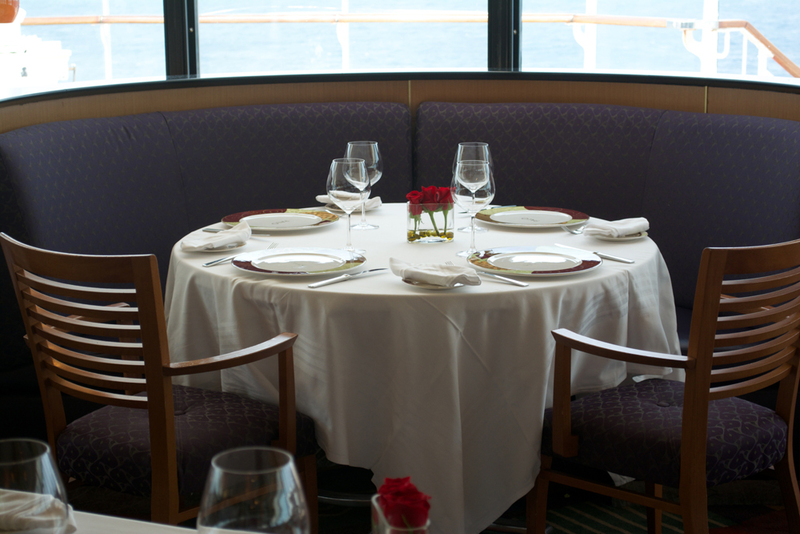 Since the ship was moving while we dined, we can’t describe exactly where we were when we ate at Palo but we can certainly tell you a lot about the dining experience. As mentioned above, brunch and dinner are two entirely different dining experiences. Let me first describe our Palo brunch. While dinner at Palo is a dressy affair, brunch has a more relaxed dress code which requests that guests not wear jeans, shorts, flip flops, or tank tops. We received a reminder of our dining time and dress code on our in-cabin voice mail system. 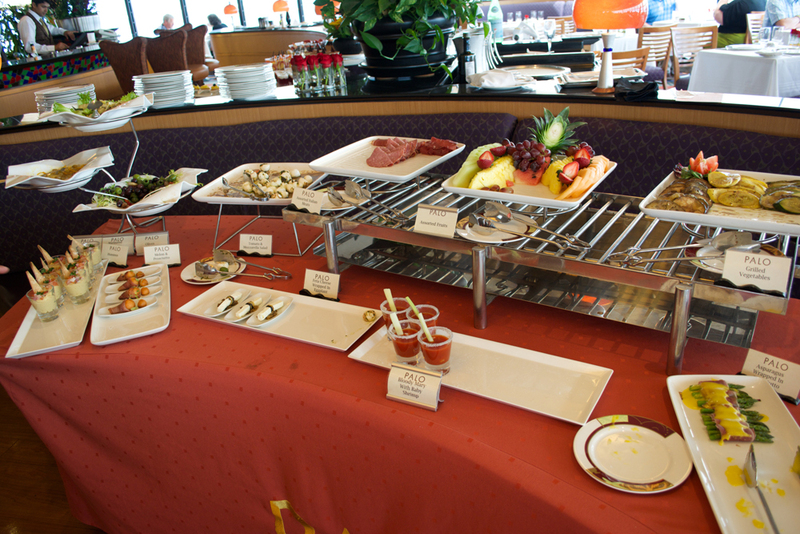 Brunch is served as a combination of an up-scale buffet and table service. On arrival you are escorted to your table which has been pre-set for just your party. Your server introduces himself/herself and takes your beverage order. 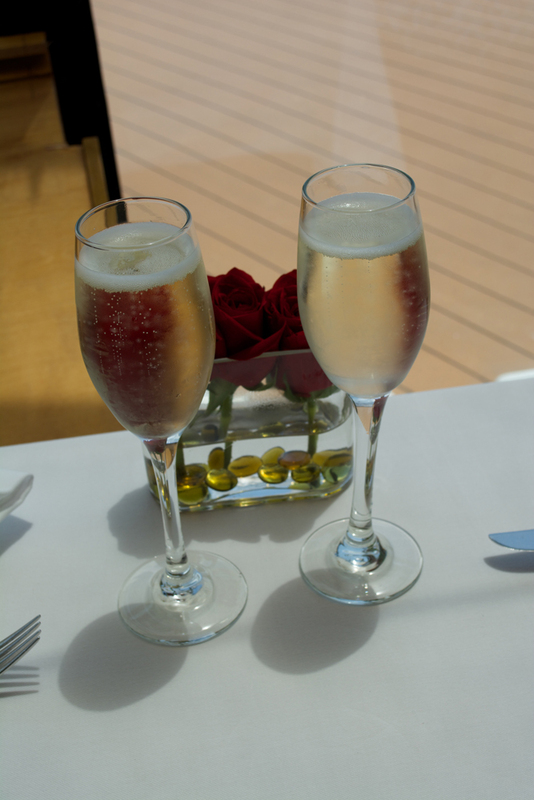 Each guest receives a complimentary glass of champagne or a Mimosa to start off the meal. After an explanation of how brunch is served you are then brought up to the buffet section where the various offerings are explained. This is no ordinary chafing dish kind of buffet. A huge variety of foods are artfully arranged for your consideration. We were blown away, and a bit intimidated, by the available choices. In addition to the traditional breakfast and lunch offerings you might expect, there are also some you will find unusual, like caviar or king crab legs. As if deciding on what to have at the buffet isn’t difficult enough, there is also a selection of prepared to order dishes that your server will explain. 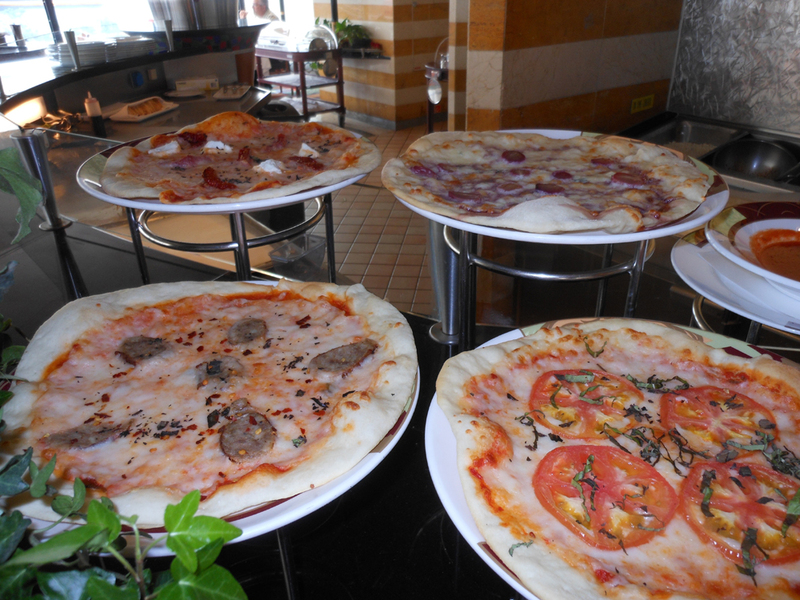 Valerie and I usually enjoy splitting one of the signature pizzettas during brunch. There are typically four different choices but you can get a half and half one if you are having difficulty deciding. We tried a half blue cheese and grape and half Italian sausage. At first we weren’t at all sure that the blue cheese and grape would be to our liking but it looked good and we decided to try it. The combination turned out to be very, very good. Our favorite hot item here is the chicken parmesan on risotto with a tomato sauce, which is not to be missed. We also enjoyed the duck and the oysters rockefella. What’s brunch without dessert? A large selection of desserts are waiting for you as you wrap up brunch. Fortunately they are all small size and you are encouraged to try more than one. I couldn’t resist the Tiramisù, which was very good. We also enjoyed the profiteroles and the Chocolate Creme de Pot. Dinner at Palo is a more formal experience. Which is not to say that it is stuffy. This is Disney after all. In the evening the dress code for men requires a dress shirt or jacket and ladies are expected to be appropriately dressy which lends an elegant touch to the room. Shorts, tank tops, swimwear and blue jeans are prohibited and Disney enforces this rule. While the sun is up the views of the wake of the ship remind you that you are at sea. As the sun goes down the windows begin to reflect the interior of the restaurant allowing you to surreptitiously study your fellow diners. You are greeted at the door and escorted to your table. Your server will introduce himself/herself, explain the dining experience, take your drink order and leave you to peruse the menu. The dinner menu has four main sections; “Antipasti, Insalatine & Zuppa”, “La Pasta”, Main (divided into “Il Pesce” and “La Carne”), and “Dolci”. While you review the menu your server will wheel over the antipasti carrello, which holds an assortment of antipasto items including proscuitto, bresaola, parmesan reggiano, marinated olives, sun-dried tomatoes. You can select specific items or just let your server put a bit of each on a plate for the table. These items are then drizzled with your choice of several infused oils and aged balsamic vinegar. 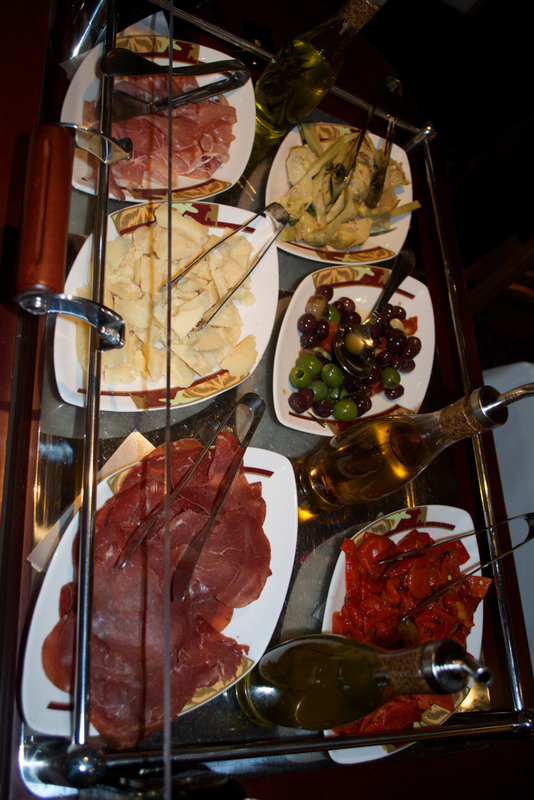 During our recent cruise we made it a point to try several different appetizers. A couple of favorites are the Grilled Portobello Mushroom and Polenta and the Sicilian Pesto Marinated Grilled Shrimp. However all the appetizers we tried were outstanding and you should go with what appeals to you. As is the case in any really good restaurant, a conversation with your server about what is best on the menu is in order if you’re having a difficult time deciding what to eat. We asked for a half-order of a couple of the pasta dishes at Palo. That gave us the perfect size to try the food but still have room for our main course. 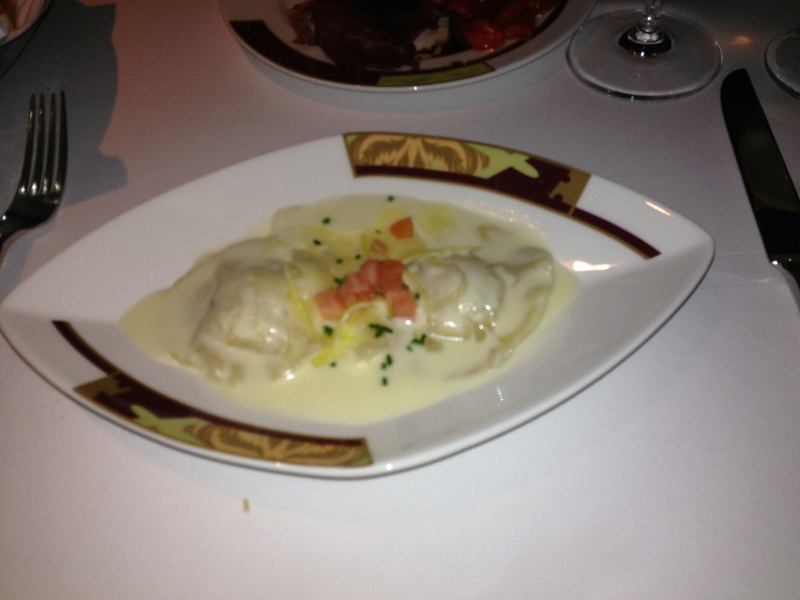 The Lobster and Mascarpone Ravioli is not to be missed, although the Penne Arrabbiata was also a good choice. We have a couple of very good friends that are big fans of the Chianti Braised Beef Ravioli. The phrase “So many choices…” comes to mind. Before bringing your main entree your server will bring a small dish of lemon sorbet to cleanse your pallet. In the Disney Cruise world, Palo is famous for its Beef Tenderloin, which is topped with melted gorgonzola cheese and a red wine sauce. Both Valerie and I had this on one of our nights and agreed that it lives up to its reputation. But in the interest of research we also tried some other entrees. 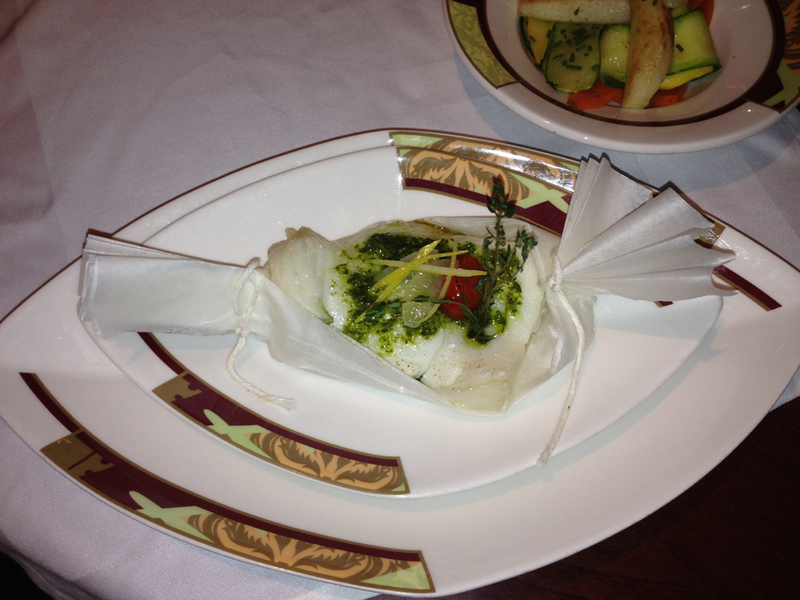 In the “Il Pesce” (Fish) column Valerie went with the Chilean Sea Bass cooked in paper and I chose the Grilled Tuna. The presentation of the bass is interesting as the dish is wheeled to table side still inside the paper and your waiter does the potentially messy work of transferring it from there to your plate along with the vegetables and fingerling potatoes. The Grilled Tuna was two separate pieces that had been seared on the outside while left still raw inside. This was accompanied with truffle-infused potato risotto. We know from past experience that the menu items in Palo change to reflect the best available ingredients so it is possible that you may have different choices when you dine there. A word about dessert – YUM! Palo is justifiably famous for its chocolate soufflé and we are simply unable to dine there without having this for dessert. It requires some advance preparation so its best to let your server know at the start of you meal that you will be ordering the soufflé. It comes accompanied by both a vanilla bean and chocolate sauce which is poured into the center according to your taste. Still, in the interest of research, we did force ourselves to sample a couple of other desserts, the Panna Cotta custard with berries and the Palo Homemade Tiramisu. 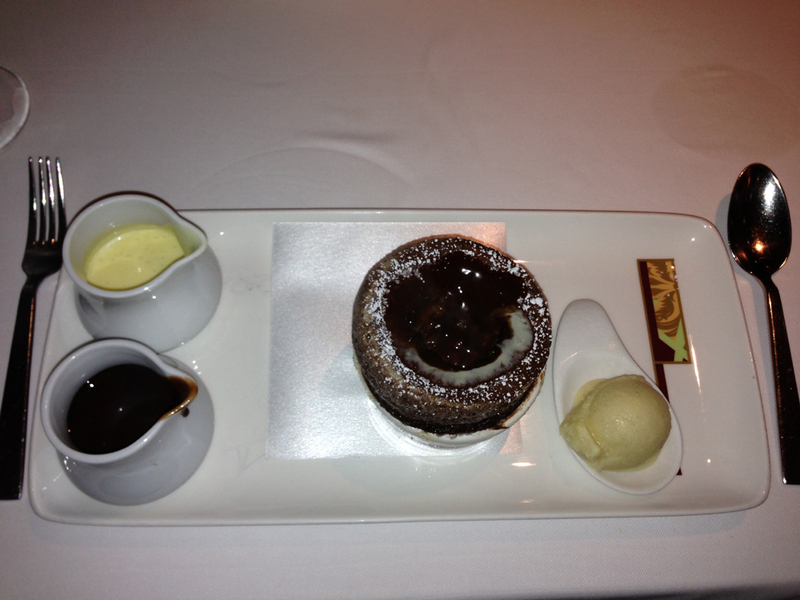 Both were excellent and make a good alternative to the chocolate soufflé. The room has an understated elegance. There aren’t any great overblown chandeliers or dark wood panels. Instead there is a clean sweep of the room with gracefully curving lines following those of the ship. For larger parties there is a separate dining room which can be closed off from the rest of the restaurant. Each table is pre-set for your party with signature plates and a cute vase with three rose buds. Reservations are required for Palo Brunch and Dinner. 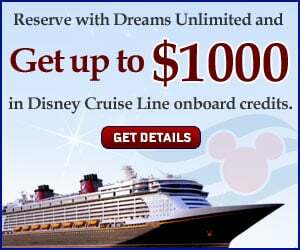 You may make reservations for each once your Disney cruise is paid in full and you have reached your booking window. 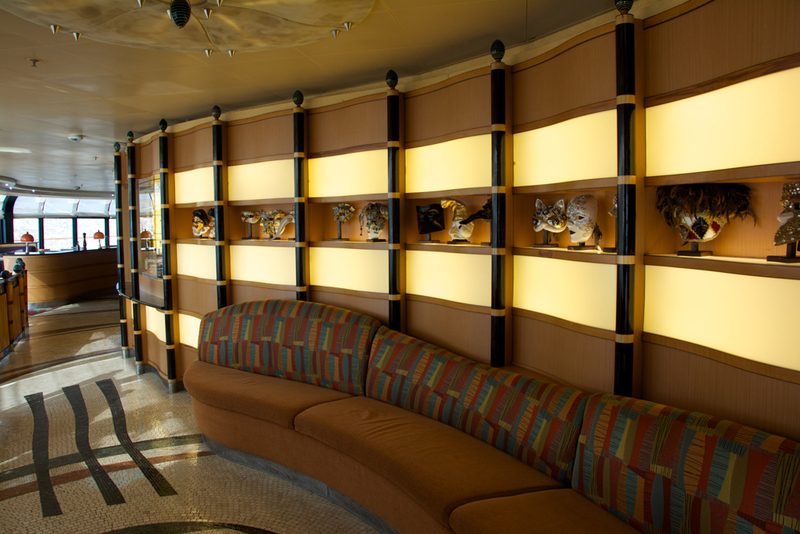 Palo reservations can be difficult to secure ahead of time unless you are a Gold or higher level Castaway Club member. Don’t be discouraged though if you can’t prebook since some dining times are held back for booking on board. If you weren’t able to secure reservations ahead of time you will have an opportunity to book the day you board the ship by going to the location designated in your Navigator. During your cruise, depending on availability, it may also be possible to make a reservation for the same day by calling the Palo number and leaving a message. Keep in mind that brunch seatings start at 10 am and continue through 1 pm. Dinner seatings start at 6 pm and run through 9 pm. Palo is an adult only restaurant and, as such, you must be 18 years or older to dine there. This policy is also strictly enforced. The cost for Brunch or Dinner at Palo is $20 per person. Alcoholic beverages are extra and there is an extensive wine list with bottles ranging from $45 to over a thousand. An automatic gratuity of 15% is added to any alcohol items. Tipping at Palo is a subject of much discussion with some believing that the $20 charge itself is adequate and others believing that you should tip based on what a similar meal would cost at a fancy restaurant. Your Palo waiter automatically receives a portion of the dining room gratuity, however we normally add an extra $15 to $25 for the two of us when signing the check at the end of the meal. We had two outstanding examples of Disney customer service at Palo on our cruise. The first was the day we boarded the ship and stopped to make reservations for an extra brunch and dinner during our 14-day cruise. The Palo Maitre’d recognized us from a cruise 2+ years ago when he was our server for the evening. The second example was on our first attempt at Palo Brunch. The seas were fairly rough that day and once we were seated Valerie was affected by the ships motion to the point where we had to leave before barely starting our meal. The staff was very concerned and offered to go get ginger ale and crackers (which are supposed to help seasickness). Before we left the restaurant the Maitre’d re-scheduled our brunch for a later date so we didn’t miss out of a wonderful dining experience. By now you are probably wondering which dining experience would be best for you. Its a difficult question but fortunately there is no wrong answer. It really depends on your individual preferences as either choice will be a pleasant dining experience. We enjoy both experiences and are hard pressed to decided between them so we take the easy way out and do both. 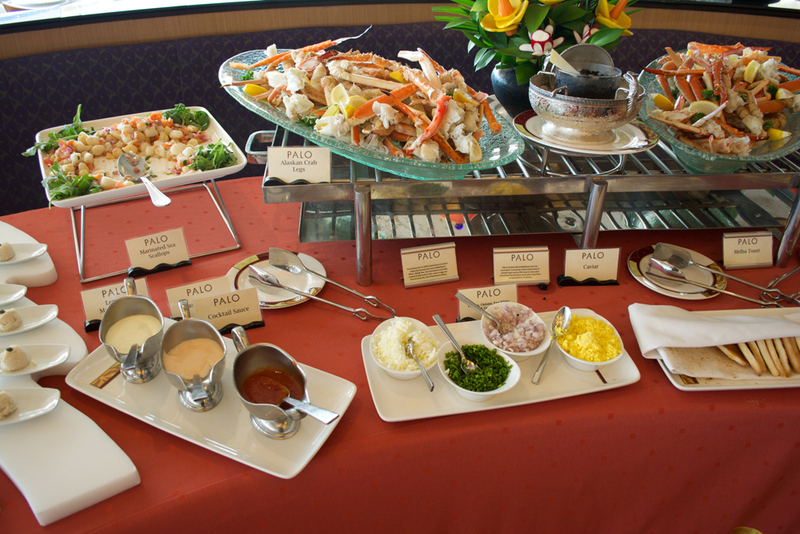 Since Palo brunch is only offered on sea days, your opportunities to try brunch are limited. I’d suggest that once your booking window opens you first try for brunch. If there aren’t any brunch times left, then reserve for dinner. 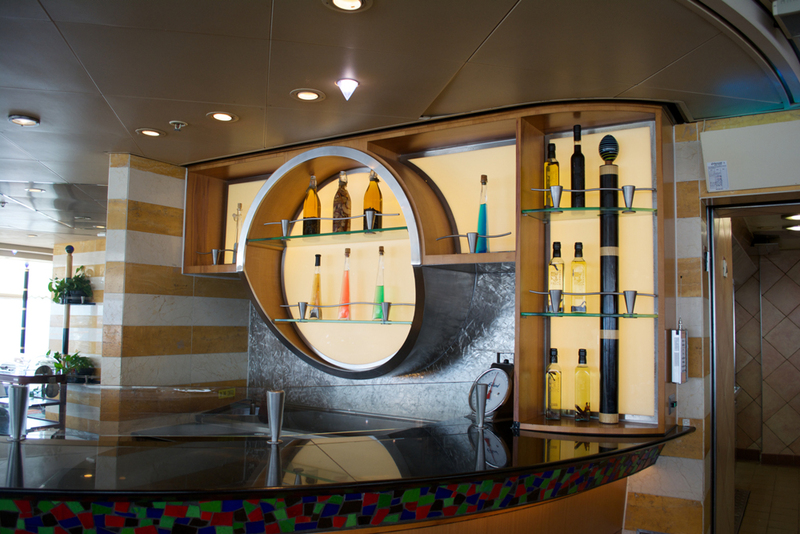 Once you are on board there may be an opportunity to make an additional reservation for brunch. This entry was posted in Disney Cruise Line, Disney Food, Foodie Tales, Foodie Travels and tagged Beef Tenderloin, bresaola, buffet and table service, caviar, champagne, Chianti Braised Beef Ravioli, chicken parmesan, Chilean Sea Bass, Chocolate Creme de Pot, chocolate soufflé, complimentary glass of champagne, Disney Cruise Line, Disney Wonder, Grilled Portobello Mushroom, Grilled Tuna, King Crab Legs, Lobster and Mascarpone Ravioli, marinated olives, Mimosa, Murano glass, oysters rockefella, Palo Brunch, Palo chocolate soufflé, Palo Dinner, Palo Disney Wonder, Palo Disney Wonder Lunch and Dinner, Palo Lunch, Palo Lunch and Dinner, parmesan reggiano, Penne Arrabbiata, pizzettas, Polenta, profiteroles, proscuitto, risotto, Sicilian Pesto Marinated Grilled Shrim, sun-dried tomatoes, Venice by Jeff Alves. Bookmark the permalink.